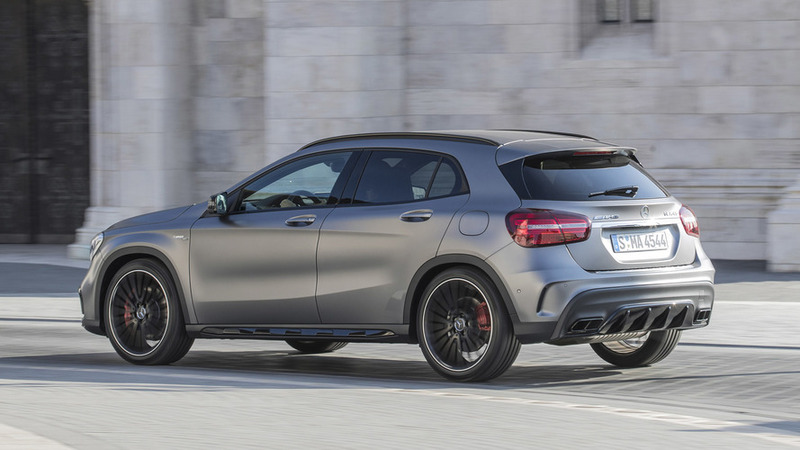 Make no mistake, the Mercedes-AMG GLA45 is a hot hatchback. 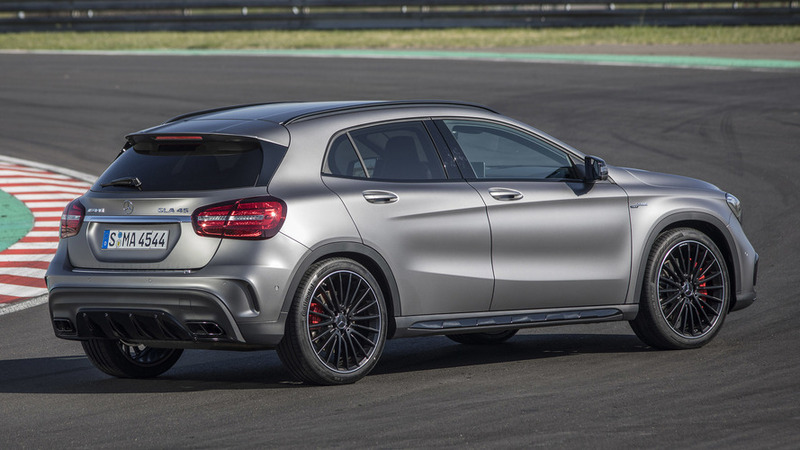 It might be based on the GLA “crossover” rather than Europe’s sexier A45 hatchback, and its upright body and relatively tall ride height might appear more suburbs than slalom. 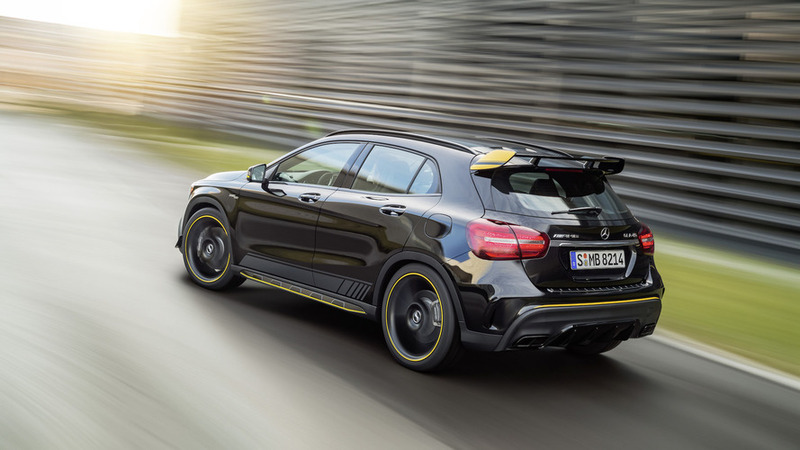 Yet the car’s stiff ride, grumbling exhaust, sharp brakes, and millimeter-precise steering all announce the GLA45’s intentions without question. This is a car for going fast and having fun while doing so. This year, the feisty 2.0-liter turbo-four gets cranked up to 375 horsepower and 350 pound-feet of torque (previously 355 hp and 332 lb-ft). It’s “still the most powerful four-cylinder engine in series production in the world,” notes Mercedes-AMG’s Steffen Jastrow. 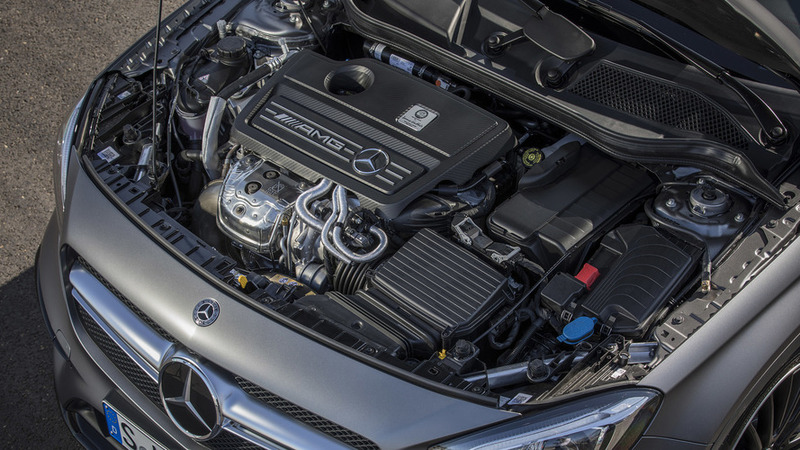 The engine, hand-built by specially trained AMG engineers in Kölleda, Germany, lets this all-wheel-drive rocket get to 60 miles per hour in just 4.3 seconds (down from 4.8 previously). As was the case even before the power upgrade, the big-turbo AMG has a somewhat bipolar personality. 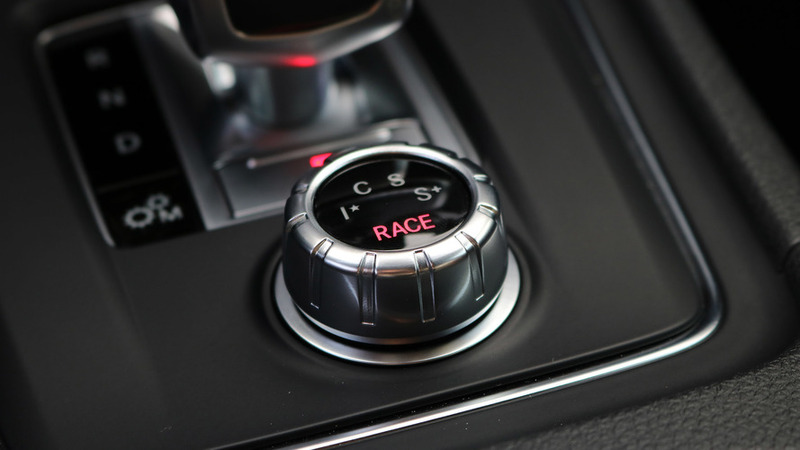 It’s easy to catch the powertrain flat-footed as the turbo dozes and the dual-clutch transmission hunts for a lower gear among its seven possibilities. 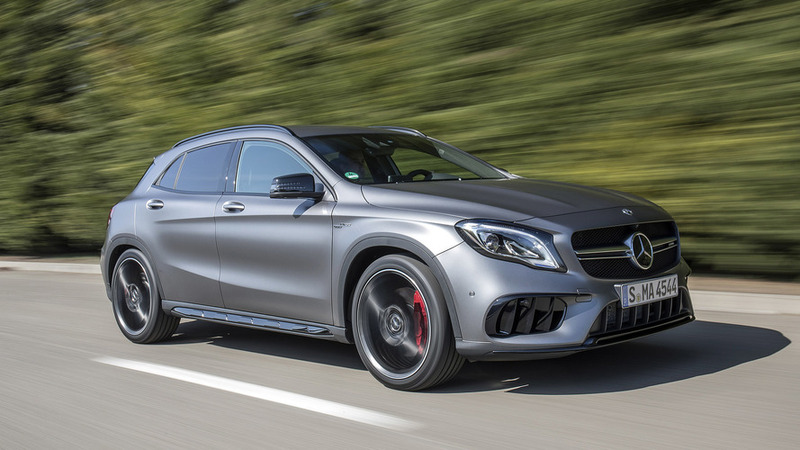 If predictable, always-on power is what you’re after, the GLA45 will disappoint. But once the turbo gets spinning and the gearbox has found an appropriate ratio (use the manual shift paddles for best results), the GLA45 rips. The turbo delivers a whammy of torque, and the snap-snap upshifts of the seven-speed dual-clutch transmission keep it at its peak. Gears three through seven now have shorter ratios to amplify high-speed acceleration a bit, too. And with such childish snarls and roars coming from the exhaust, it’s tough to resist the urge to keep on tearing down every open stretch of road. 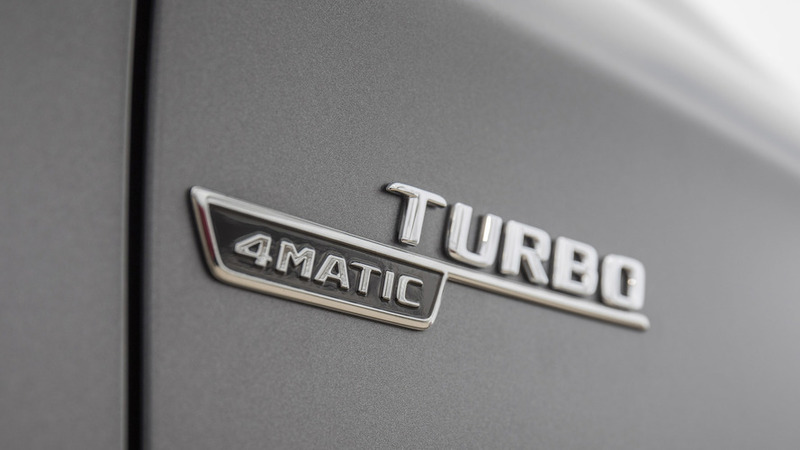 This year, the feisty 2.0-liter turbo-four gets cranked up to 375 hp and 350 lb-ft of torque. Top speed is a more-than-adequate 155 mph unless you pay for the AMG Dynamic Plus package, in which case that figure rises to 167. More important, the option group adds a limited-slip front differential, adaptive suspension, and a Race driving mode for even more back-road or track-day heroics. In the Hungarian countryside, the GLA45 eagerly hoovers up sinewy back roads. Sharp turn-in and a dearth of body roll impart the confidence to carry big speed through bends, with the snug seats holding me in place and the paddle shifters responding instantly to every press. Yes, this is a fast car. Perhaps the only letdown is the utter lack of feedback from the steering wheel. Speed and capability, though, abounds. In urban driving, the GLA45 has all the vices of any other small car that’s been injected with performance steroids. The suspension never stops bouncing, the exhaust drones, and the engine’s lazy turbo spool-up can make low-speed acceleration a game of guess-and-check. The stop-start, too, sends a shudder through the cabin each time the four-cylinder comes back to life. But just as I put up with these small compromises in other small performance cars, so too do I overlook them for the most part in the Mercedes. It’s worth it for the way the car drives elsewhere. 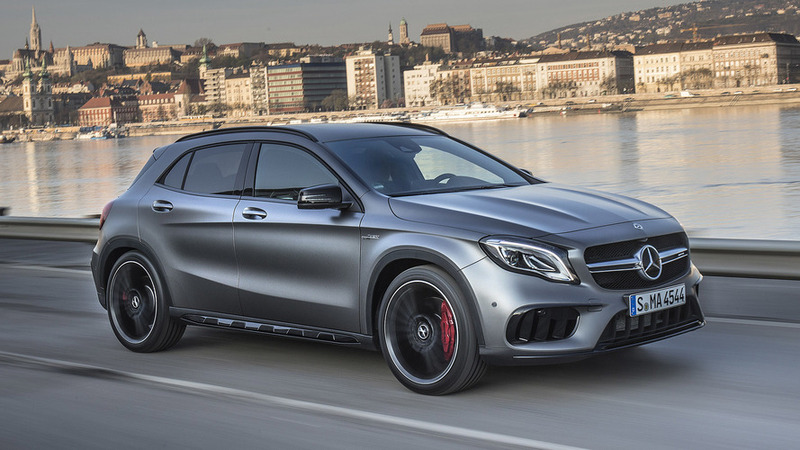 This year’s GLA45 has had more revisions than just its powertrain tweaking. For starters, the fascias and wheels are restyled, with the front bumper’s vents all helping aim cool air at the radiators and intercoolers, while the rear spoiler has a new lip said to improve aerodynamic performance. A backup camera becomes standard on all GLA-Class models, as do a crisper eight-inch infotainment display, LED headlights, redesigned instrument clusters, new wheels, and various other tweaks. They’re minor changes, but enough to freshen the car noticeably. Here’s a fast, evocative toy that plays by its own rules but can still be civilized enough to roleplay as your daily driver. 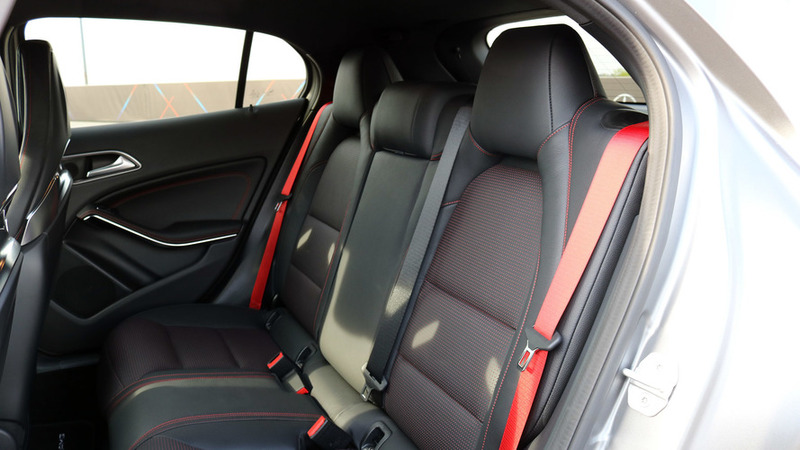 Cargo space is still on the small side in a general sense, but it’s unlikely to be a deal-breaker for anyone shopping the parking lot-friendly compact dimensions of a GLA – and far more spacious than the mechanically identical AMG CLA45 sedan. The back seat is at least roomy enough for bringing friends along for the ride, with more headroom than the CLA45, allowing me to sit upright without issue. AMG dress-up parts on the inside include a flat-bottom steering wheel, an extra AMG display mode in the center trip computer (knowing your oil temperature is important in hard driving, after all), sport pedals, an AMG-specific console shifter, bolstered seats, accent stitching, and so on. On my test car in particular, the red stitching, air-vent trim, and 12 o’clock stripe on the steering help break up a cabin that’s otherwise composed mostly of dark materials. 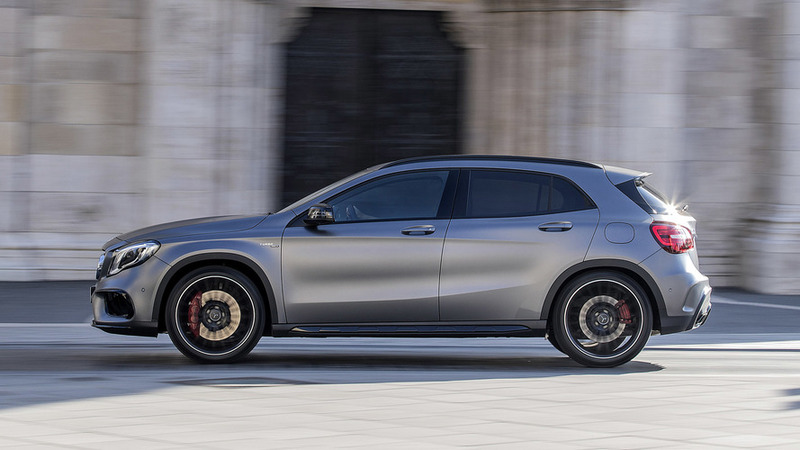 From outside, look for the big wheels, cross-drilled brake rotors, rear wing, and more aggressive body kit to tell the GLA45 apart from the 208-hp GLA250. 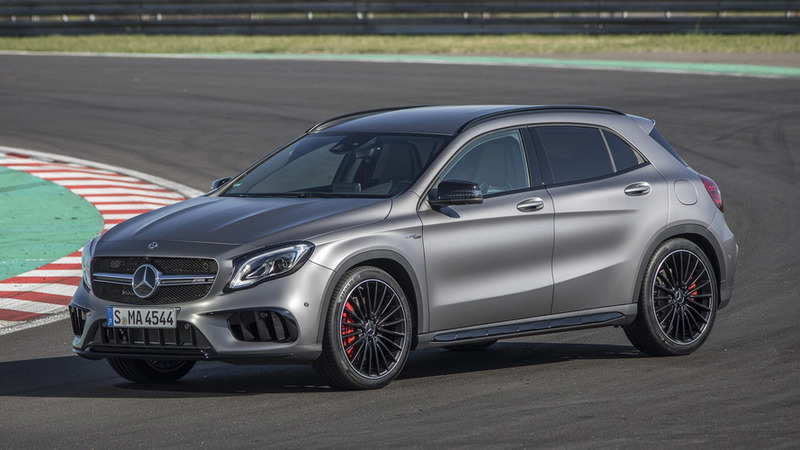 Add in the fact that it sits two inches lower than the GLA250, and the 45 has a fantastically purposeful stance. As you start to think logically about this slightly illogical car, it’s fair to question where the GLA45 fits into the performance-car hierarchy. Certainly it’s way more expensive than the Ford Focus RS or Subaru WRX STI. On price, it stacks up closely against the BMW M2, but that car – rear-wheel-drive coupe with available manual gearbox – is arguably the purer toy. 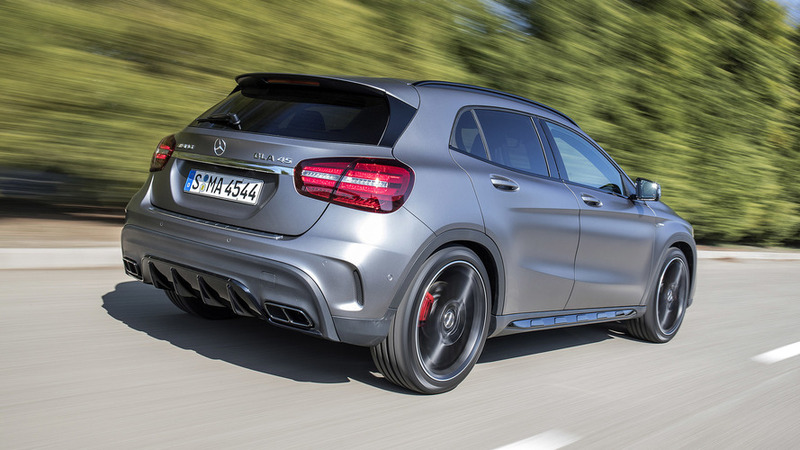 So the GLA45 kind of stands on its own with no obvious direct rival. That’s not a bad thing. Here’s a fast, evocative toy that plays by its own rules but can still be civilized enough to roleplay as your daily driver. It’s the perfect indoctrination into the cult of AMG. If it’s your first car from the brand, you’ll no doubt be hooked and want more. Which is, of course, the entire goal.